We are in the third and definitely most prolific generation of Hemi engines. And like all Hemi engines, the 5.7L engine in the 2011-2014 Dodge Durango and 2011-2016 Jeep Grand Cherokee respond well to incremental air flow into the cylinders, which is why Spectre developed its 9021K intake kit. The first generation of Hemi engines spanned the period of 1951 until 1958 when various versions, names, and displacements were fitted to DeSoto, Dodge, and Chrysler models. The most powerful Hemi of the first generation was the Chrysler 392 V8 that not only became the standard in drag racing for several years, but also the inspiration for the later 392 engine. Interestingly enough, Plymouth, did not have a street Hemi engine in its line until 1966. Then came the 426 Hemi, nicknamed “The Elephant” by company engineers. Designed to dominate NASCAR racing, the Mopar folks were told to take their engine back to Detroit and install it in some cars available to the public before they could race it again. While Chrysler tamed The Elephant for the street and geared up to build enough cars to satisfy NASCAR, it took the 426 drag racing, where it quickly supplanted the 326. To this day all Top Fuel and Funny Car motors, regardless of what brand is on the valve cover, use the architecture of the 426 Hemi. The third generation of the Hemi, now actually marketed under that name (which Chrysler has wisely trademarked), was the 5.7L V8 in Dodge Ram trucks beginning in 2003. From there the line has grown into four different engine incarnations. Currently, Fiat Chrysler of America (FCA) offers supercharged 6.2L Demon and 6.2L Hellcat Hemis, plus the modern 392 Hemi that shares the name of its famous predecessor, and the original third-generation 5.7L Hemi engine. It's the original 5.7L Hemi that revived the tradition and the name Hemi to which we turn our attention. The 5.7L Hemi engine is based loosely on The Elephant engine of the 1960s. Design updates were suggested by some of the same engineers who worked on the second generation 426 Hemi. 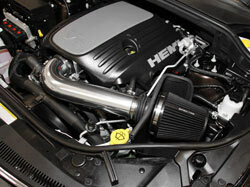 While not a pure Hemi like its predecessors, the 5.7L engine’s combustion chamber is pretty close. There’s a revised squish area within the combustion chamber and the accommodation for two spark plugs, all of which increase power, lower emissions, and increased fuel economy. In fact, the combustion chamber somewhat resembles that of one of today’s 500 CID Top Fuel second generation Hemi-based race motors. Designed from the ground up to accommodate a Multiple Displacement System (MDS), the electronics shut down four cylinders of the 5.7L Hemi when driving at cruising speeds in order to improve fuel economy and reduce emissions. 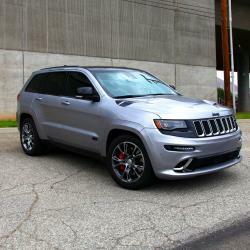 Both the 2011-2016 Jeep Grand Cherokee and 2011 – 2014 Dodge Durango feature the MDS function. And if there’s one thing known about Hemi engines, it’s how well they respond to upgrades, particularly ones that feed the engine more air, like the Spectre SPE-9021K intake system, with its black filter element. The Spectre SPE-9021K cold air intake system moves the air intake away from the hot engine and protects it with a heat shield so only cold, fresh, outside air can reach the air filter. Cooler air is denser, carrying more oxygen that prompts the engine’s ECU to add more fuel, thereby increasing horsepower. You’ve probably noticed the effect when driving your truck on a cool morning. 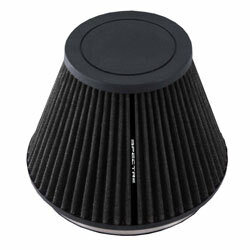 The Spectre intake system utilizes a seven-inch non-woven synthetic filter media to help protect your engine from harmful dirt, dust, and debris. 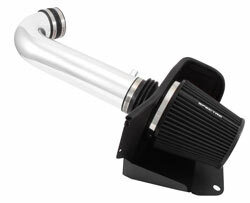 The system comes with the reusable free-flowing tapered conical Spectre HPR9892K air filter, velocity stack, mandrel-bent polished aluminum intake coupler, and a black powder coated heat shield to help prevent hot engine air from entering the intake inlet. OEM brackets and hardware are used so that no holes need to be drilled, and accommodates all factory emissions and vacuum lines. While the Spectre SPE-9021K air intake system for Hemi-powered Grand Cherokees and Durangos comes with a black filter, Spectre Performance also offers 9021B, which comes with a blue filter, and SPE-9021 which comes with a red filter. All three versions offer the same outstanding airflow and filtration capabilities and are constructed of high quality materials including washable synthetic media, urethane and steel mesh. They’re available in different colors to meet each customers’ particular preferences. The Spectre SPE-9021K air intake system for 5.7L Hemi-powered Grand Cherokees and Dakotas brings performance increases that can be achieved by a simple DIY installation that takes under an hour with common hand tools and with no need to re-calibrate engine electronics. The kits come complete with all required hardware for the look of an OE installation. Inspect your Spectre filter every 7,000 miles and as it becomes dirty, give it a good cleaning with the Spectre HPR4820 Accucharge precision air filter cleaning and oiling system, which was developed specifically for all Spectre HPR air filters. Spectre’s AccuCharge precision oiling system features graduation on the bottle for precise measuring and an easy-to-use squirt top bottle making the application both effortless and accurate. The system comes complete with a pump spray bottle of cleaner and one of filter oil.